As business leaders deny they were deceived into signing a letter supporting Tory spending plans, Cathy Newman asks which party is the most credible on tax and employment. 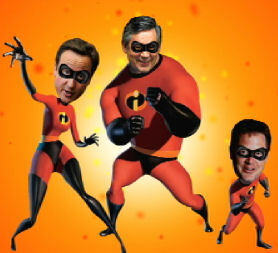 The three party leaders are vying with each other to be superheroes, saving Britain plc from economic destruction. Each says the other cannot be trusted on tax and spend. Today Labour and the Tories traded blows on who had the more incredible economic policy. David Cameron thinks he can do it if he B&Qs it. The boss of the DIY chain was one of 23 senior business people to lend credibility to Tory plans to reverse part of Labour's national insurance rise in a letter in today's Daily Telegraph. Unlike Mr Cameron's backers, the small business bosses who attended a Downing Street breakfast this morning were not household names. But Labour pointed out that most of the signatories to the Telegraph letter are paid-up Tories who either individually or through their companies have given £2.5m to the party. But one has donated money to Labour as well. Labour hit back in an early morning press conference - the opening salvo in the election campaign, which will formally start next week. The party published a 180-page dossier setting out what it said was a £22bn credibility gap - the amount, it says, the Tories need to find through additional tax rises or spending cuts. But later this afternoon no fewer than seven employers' groups, including the CBI and the British Chambers of Commerce, weighed in behind the Tories. It was a coup that senior Conservative sources insisted had not been orchestrated by them. At Labour headquarters a rival list of business backers is being put together for release later in the campaign. But the party may not be able to count on some of the supporters it signed up in 2005. Several of those who penned a letter to the Financial Times have become disillusioned with Labour. One has called on Gordon Brown to go, another is now a close friend of David Cameron, and a third was expelled from Labour after donating to the Lib Dems. But one Labour supporter and donor who has stayed loyal is Lord Sugar, who will head up a new government task force on small businesses, the prime minister announced today. It is like the Conservatives have flicked a switch. Today, I got invited into the Conservative war-room and they seem a pretty euphoric lot following the apparent endorsement of their National Insurance from Britain's business elite - George Osborne thinks it's a vitally important day in the campaign. And when I spoke to George Osborne, there was no reference to Greek-style interest rates, no reference to austerity, nothing on "the National debt is our number one priority". Instead "securing the recovery", and "a Conservative government will bring hope, recovery and jobs" was the order of the day. If you doubt this, have a look at this interview that I did with David Cameron in Davos a few weeks ago, and compare it to George Osborne today. As I said, a switch has been flicked. Read Faisal's blog in full here. The Labour peer told Channel 4 News it was blatantly obvious why employers opposed a rise in national insurance because it would save them money, but they were wrong to do so. "Ask every schoolkid at school would they like an iPod and they would say yes, with no regard as to who is paying for it. No-one, including the chancellor, wants to see an increase in NI. "I assume the increase is needed to balance the books. It's very easy to promise cancellation. However those advocating it need to explain where they will find the money to do so." Channel 4 News FactCheck has analysed Labour's dossier. We conclude Labour is on firm ground to raise questions about how the Conservatives will fund their £1bn council tax freeze but shakier in its £4.9bn costing of Tory tax breaks for married couples. A Conservative April fool created a fictitious department of government waste. But the party said the examples of Labour squandering public money were true - including a massage room in Ed Balls's department.